7-Eleven becomes first convenience retailer chain in Canada to accept Alipay and WeChat Pay. These mobile payment options are currently available at 35 select locations in Vancouver and Toronto, with plans for expansion in the next few months. “The explosion of mobile usage and QR-based mobile solutions offer opportunities for retailers to provide an engaging and new retail experience. We are thrilled to collaborate with 7-Eleven in a joint effort to redefine convenience in Canada,” says Wei Jiang, president and chief operating officer of Citcon, a leader in cross-border mobile payment and marketing solutions. 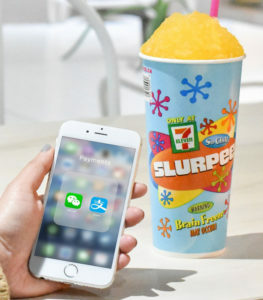 In an increasingly digital world, 7-Eleven continues to push for innovative services and convenience solutions that elevate their customers’ experience. For Chinese consumers where mobile payments are the norm, facilitating Alipay and WeChat Pay, China’s leading mobile payment platforms, 7-Eleven provides residents and tourists with an easy and familiar way to complete transactions abroad.